The City regulator, the Financial Conduct Authority, is "not going soft on the banks", its interim chief executive Tracey McDermott has said. In December the FCA said it had shelved plans for an inquiry into the culture, pay and behaviour of staff in banking. Critics say the Treasury successfully put pressure on the FCA to be more "light touch" with financial firms. But Ms McDermott insisted the FCA was taking action, including a £72m fine imposed on Barclays in December. Speaking to the BBC she said: "We're not going soft on the banks, we're not being told what to do by the government. "We have objectives which are set for us by parliament and statute, and we are determined to deliver on those." Ms McDermott, who took over the role after Martin Wheatley left the organisation in September, gave examples of the regulator's action on Libor and Foreign Exchange Trading, and the FCA fine on Barclays over poor handling of financial crime risks. "If you look at what I've been doing in the last six months since I've been in the role as chief executive you'll see that we have continued to take action against the industry," she said. However, critics have pointed to recent decisions by the FCA which they say show it is taking a lighter touch to regulation. On New Year's Eve the authority announced it was scrapping its inquiry into whether pay, promotion or other incentives had contributed to scandals involving banks in the UK and abroad. The FCA also decided to take no further action against HSBC after allegations it helped customers of its Swiss subsidiary avoid tax. Former business secretary Sir Vince Cable told BBC News he was among those who believed the FCA was going soft on banks. "It was very clearly signalled when the chancellor effectively got rid of the tough regulator Martin Wheatley as head of the organisation. "And the organisation has been in something of a turmoil since. "We've had a whole series of measurers, a weakening of legal sanctions, which suggests that the regulators are expected now to soft pedal." Similarly, Peter Hamilton, who is a barrister whose cases involve the financial services market and FCA regulation, also said the FCA had softened its stance since Mr Wheatley was forced to step down. Other critics have highlighted the decision not to publish a report on how firms offer inducements to some staff to encourage them to make sales. The FCA decision to consult on whether to impose a time limit beyond which customers could no longer put in a Payment Protection Insurance claim has also attracted criticism, along with a move to set up an expert panel to consider whether to allow commission-based selling of investment products again. 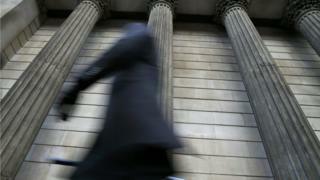 Banking reform: What has changed since the crisis? The FCA said a focus on the culture in financial services firms remained a priority. "We have decided that the best way to support these efforts is to engage individually with firms to encourage their delivery of cultural change, as well as supporting the other initiatives outside the FCA," a spokesman said. Chief Secretary to the Treasury Greg Hands said changes introduced by the Conservatives had made the FCA "fundamentally stronger than it was a few years ago". "From April, reckless bankers will face up to seven years in jail and we have introduced the toughest system of bankers' pay of any major financial centre in the world," he added. Ms McDermott pulled out of the race to permanently run the City watchdog earlier this month. She said she withdrew from the recruitment process to become the permanent chief executive for personal reasons and she has not decided whether to stay on at the regulator when her successor is appointed. Mark Garnier, a Conservative member of the Treasury Select Committee, said the new FCA chief would have to both protect consumers and keep good relations with the banks. "It's a very difficult tight rope to walk. The next chief executive may feel that they have to do what they think is the will of the Treasury," he said. "We have to make sure we don't create an impossible environment for the new chief executive who will go into a job which they will be set to fail at," he said. Chris Philp, also a Conservative member of the Treasury Select Committee, told BBC Radio 4 he was "personally concerned" about the FCA dropping its inquiry into banking culture, but he denied there had been any political interference. Ms McDermott is due to appear before the committee along with FCA chairman John Griffith-Jones later this month to answer questions.